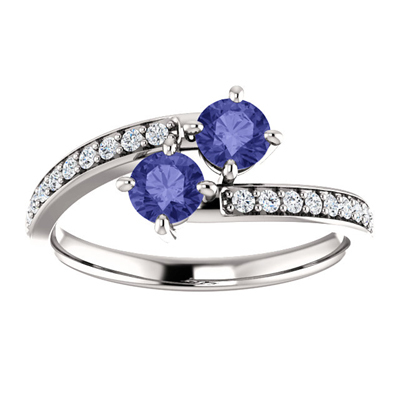 The purple color of the tanzanite stone is a nice option that is deep and charming. There are two 4.1mm tanzanite stones found on the top of this "Only Us" ring while the band has 19 cubic zirconia accents. This 0.19 tcw ring has a sterling silver body to go with it too. We guarantee our Tanzanite and CZ Two Stone "Only Us" Ring in Sterling Silver to be high quality, authentic jewelry, as described above.